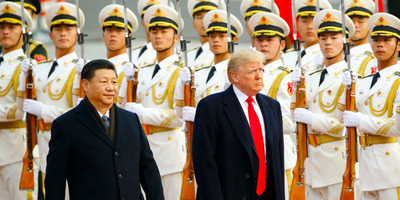 Getty Images / Thomas Peter-PoolPresident Donald Trump with Chinese President Xi Jinping in China. China and its neighbours have been rapidly enhancing their militaries in recent years. Countries in the region, worried about Beijing and uncertain about the US, are also looking to boost cooperation with each other. Beijing is in an advantageous position and can wield considerable influence. Military spending has ramped up in Asia, led by China, whose addition of submarines to its fleet has inspired similar ambitions among its neighbours. Beyond hardware, however, countries in Asia are also reassessing the balance of power there, contemplating how to engage China and what role the US – long a guarantor of security and trade in the region – will play going forward. That has translated into greater interest in local partnerships. First proposed in 2007, the Quadrilateral Security Dialogue, or Quad, made up of the US, Japan, Australia, and India, gained new life last year, when officials from those countries met to discuss a “free and open Indo-Pacific” and seven core themes, including freedom of navigation, maritime security, and a rules-based order in the region. Some members of the Quad have tread carefully out of concern about China, which protested its restoration. India has also expressed reticence about the partnership – in part over concerns about its own autonomy as well as doubts about the other three countries’ approaches to China. 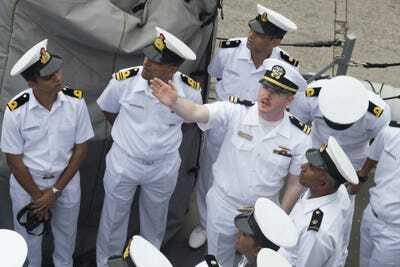 (US Navy Photo by Mass Communication Specialist 2nd Class Tyler Preston/Released)A US sailor aboard Arleigh Burke-class guided-missile destroyer USS Howard gives a tour to Indian sailors during Malabar 2017. But cooperation between countries in the region continues, with an eye on securing and enhancing trade and security. Japan has increased efforts to counter China’s Belt and Road initiative, ramping up international partnerships and investments – including in Sri Lanka, where a recent Chinese port project has angered India. Australia has followed suit, talking to the US, India, and Japan about a joint regional infrastructure program to rival Beijing’s outreach. Australia, India, and Japan have been pursuing a trilateral partnership since late 2015, aimed at ensuring “open and free” movement in the region and advancing their shared interests. 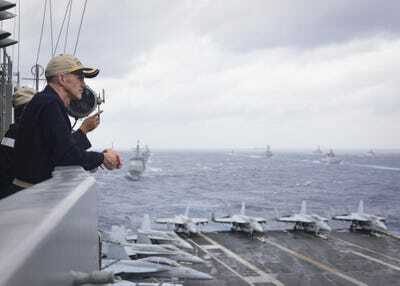 India and Japan did three days of antisubmarine exercises in the Indian Ocean in October. In March, Vietnam’s president visited India, where the leaders of the two countries put out a statement pledging to continue defence cooperation. Two days later, US carrier made a port call in Vietnam – the first such visit in four decades and a sign of growing ties between the US and Hanoi (whose acquisition of submarines has also irked China). Around the same time, India’s army chief said that New Delhi was working with Australia, Japan, and the US to guarantee “freedom of navigation” in the region. A few days later, India began its Milan 2018 naval exercises, underscoring New Delhi’s growing engagement with the region. The Milan exercises were first held in 1995 with four countries. This year, 16 countries joined the drills, which for the first time included a joint multilateral exercise at sea. The naval portion took place around the Andaman and Nicobar Islands, strategically located near the Malacca Straits, which connects the Indian and Pacific oceans. 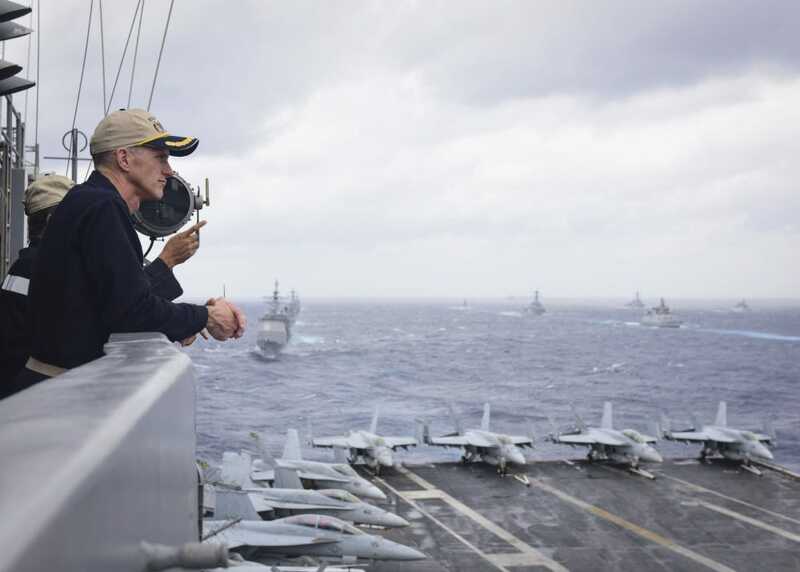 (US Navy photo by Mass Communication Specialist 2nd Class Holly L. Herline)US Navy Rear Adm. Bill Byrne, commander of Carrier Strike Group 11, observes Indian, Japanese, and US ships from the aircraft carrier USS Nimitz during Malabar 2017 in the Bay of Bengal, July 17, 2017. As with the Quad, India, which uses Russian-made military hardware, has been reluctant about joint operations. Its reticence about information-sharing has reportedly hindered those exercises and broader interoperability. China has made clear its displeasure with such regional cooperation. China has also flexed its muscles in the South and East China Seas. In January, a Chinese sub was detected around the Senkaku/Diaoyu Islands, which are controlled by Japan but disputed by Beijing. 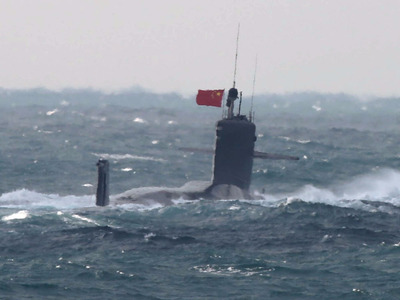 It the first confirmed identification of a Chinese sub that area and drew a Japanese protest. Chinese ships have entered that area on six days this year, most recently on March 23. Japanese Ministry of DefenceA Chinese Shang-class nuclear attack submarine in the contiguous zone of the Senkaku/Diaoyu Islands. In recent days, Vietnam, which has sought to mollify Beijing after the US carrier’s visit, assented to Chinese pressure to scrap an offshore oil-drilling project – the second time in a year Hanoi has done so. The cancellation is likely to be read in Beijing as a sign Vietnam’s strategic thinking has not changed, despite US shows of force in the area.